… and yes, *sometimes* (actually more often than not nowadays) he would insist that Daddy and Mommy brush our teeth too, after he has completed his task! How can we turn down a “Mommy, brush teeth!” or “Daddy, brush teeth!” request that comes with a gentle shove towards the bathroom? I can see sparkle coming out from his teeth. Joyce says: LOL! You can??!!! Hehe…that’s the whole idea! Joyce says: Yes, he loves brushing his teeth! very good sure no decayed tooth! Joyce says: I was being *diplomatic* when I said “gentle shove”. hehehe…. but not to the same extent as your boy la! hehe…looks like koko is biting the tootbrush!! Joyce says: Nola, he is trying to reach every part of his teeth! 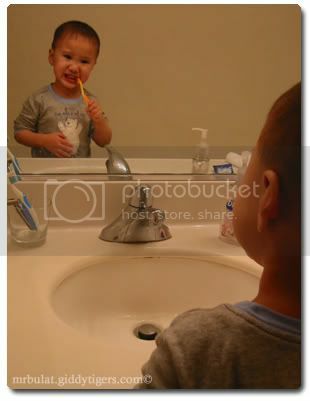 Hope he’ll continue to love brushing his teeth forever. Bye bye tooth decay. Joyce says: Yes, we would very much like that. Joyce says: Yes, he gargles and spits pretty well, but I think he does swallow a bit of the toothpaste while brushing. And he won’t allow me to brush for him now! Yes, Ethan is using Oral B, though I can’t remember if it’s Stage 2 or 3. Ethan is growing to be a cute handsome big boy dear, good job to mummy and daddy !! Joyce says: Thanks dearie! He brings us so much joy every day! Joyce says: Thankfully just once But he will insist till we do it!